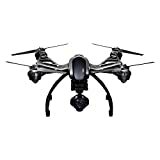 If you’re in the market for a professional grade quadcopter camera drone but you don’t want to pay the kind of money you typically have to shell out for a professional grade quadcopter camera drone, today is your lucky day. Amazon is running a big one-day sale on refurbished Yuneec Q500 4K Typhoon Quadcopter Drones, slashing the already discounted price by another $175. It’s a great deal on a great drone, and you have until the end of the day to pull the trigger. ST10+ Ground Station with a built-in touch screen Wirelessly control the drone from up to 2,624′ away. Autonomous flight modes Follow me, watch me, dynamic return home and geo-fencing flight modes allow versatile use. Rechargeable 5400 mAh lithium-polymer battery Provides extended flight times. Sun shield Helps ensure optimal video capture in bright sunlight. CGO Steady Grip mount Helps you capture stable footage.